Description: Rare horse tail hitching post, cast iron in the round, 19th century. Designed as a horse tail looped and wrapped around a post of four ribs over shaft ending in circular bottom, used to anchor post in ground. American. 62 1/2 inches high. Description: Cast iron bird bath, two part, bowl cast with concentric rings over a fluted column on square base. Labeled ORNECO in the casting under the bowl. Unusual cast iron form. Early 20th century. 29 inches high and 22 inches wide. Description: Bronze fountain of a fish, verdigris finish, plumbed. Good casting with fine details. Early 20th century. Unusual and charming for any garden. 11 1/2 inches high, and 9 inches wide. 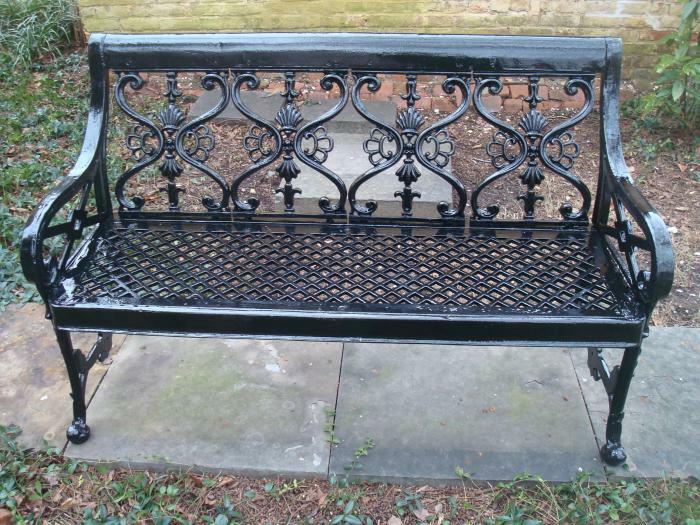 Description: Curved cast zinc garden bench in the 'Laurel' pattern of large leaf fronds with berries and arms ending in bird heads with wings. 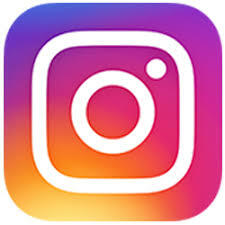 Of nut and bolt construction. American, very early 20th century. Provenance: This garden bench was shown in the 1938 movie 'Jesabel' starring Betty Davis and Henry Fonda. Betty Davis was filmed sitting in the garden on this bench. 43 inches high, 32 inches wide and 30 inches deep. Professionally cleaned and repainted a light green. Note: In ancient times leaves of laurel formed into a wreath conferred as a mark of honor for heroes and victors, honor and glory won for achievement. 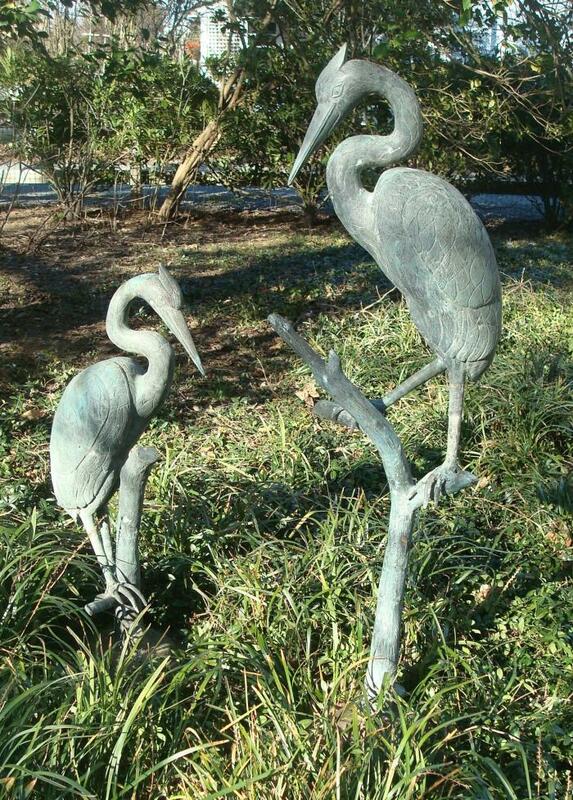 BRONZE HERONS TWO EARLY 20TH C.
Description: An unusual pair of bronze heron statues, early 20th century. Tall one perched on branches 54 inches high. A standing shorter one 38 inches high. Both in good condition. Herons are long legged fresh water coastal birds, some refer to as egrets or bitterns. Description: Set of five 18th century engravings or Vue Optique prints or propective prints with hand coloring, on laid paper, published by Daumont, Rue St. Martins, Paris. Vue Optiques, published in Europe during the 18th century, were a form of entertainment meant to be seen through devices called "optical machines", "optiques" or "zograscopes." The prints were exhibited by traveling showmen in the streets of Europe and collected by the upper classes who had viewing machines at home. This set of five custom framed Vue Optiques is of famous 18th century French gardens. Vauxhall Gardens, Cascades of Versaille, Cascade jardin du Duc de Parme, and La Cascade de Vauxhall. Custom framed. Condition is good with minimum foxing. 13 1/4 inches high, and 19 1/4 inches wide. Set $1100. Description: Charming heavy ceramic umbrella stand beautifully decorated with polychrome flowers on white glazed ground. 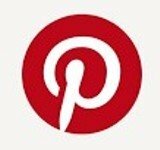 Will brighten any room and so useful. 18 inches high and 8 1/2 inches wide. Early 20th century. $195. Description: Large 19th century cast iron garden urn or planter with egg and dart designed rim, lobed bowl, fluted socle, and sitting on stepped base. This urn has been professionally cleaned, repainted and been given a stepped metal plinth, presenting it well. The beautiful large bowl can hold large plants or arrangements that makes it a perfect piece to feature as a focal point in the garden. 25 inches high and 29 inches wide. $495. Description: Chinese reverse painting on glass of young boy playing with frog, in original frame and wood backing. Very early 20th century. This was called 'verre eglomise' after a Parisian picture framer Jean- Baptiset Glomy (d. 1786) who used a technique of painting on the reverse of glass, originally attributed to the Chinese. This is a charming and unusual scene of a child playing in a landscape with a frog, with a mirror background. Excellent condition $300. Description: Pair of zinc herons with remains of old paint. These have spears under feet to anchor them in the soil. Herons are long legged fresh water coastal birds, some refer to as egrets or bitterns. Found on the Eastern Shore of Maryland. Early 20th century. 34 inches high and 26 inches wide. Pair $450. Description: Rare set of four antique cast iron rectangular planters or 'fern boxes', as they were often named in the 19th century. These have been professionally cleaned and repainted black, ready to place. 11 inches high, 20 inches wide and 11 inches deep. Late 19th or very early 20th century. 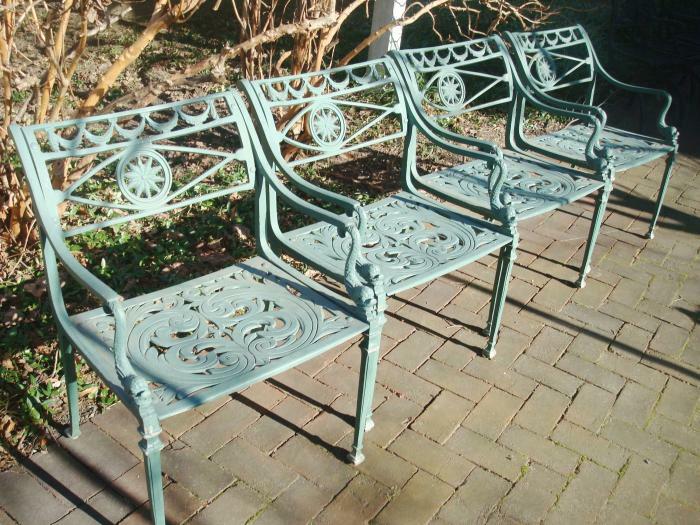 Description: Set of four cast aluminum garden chairs, with swag and star backs and dolphin arm terminals. These chairs are a very ample size providing very comfortable seating. Early twentieth century. Illustrated in the original Florentine Craftsmen Company,N.Y. catalog, a New York company noted for superior workmanship and quality in garden furniture for over 90 years. Florentine Craftmen Co. now has been bought out by Kenneth Lynch & Sons. These chairs are of nut and bolt construction, not welded, a better method and no longer found in the market. 30 inches high, 21.5 inches wide, and 20 inches deep. 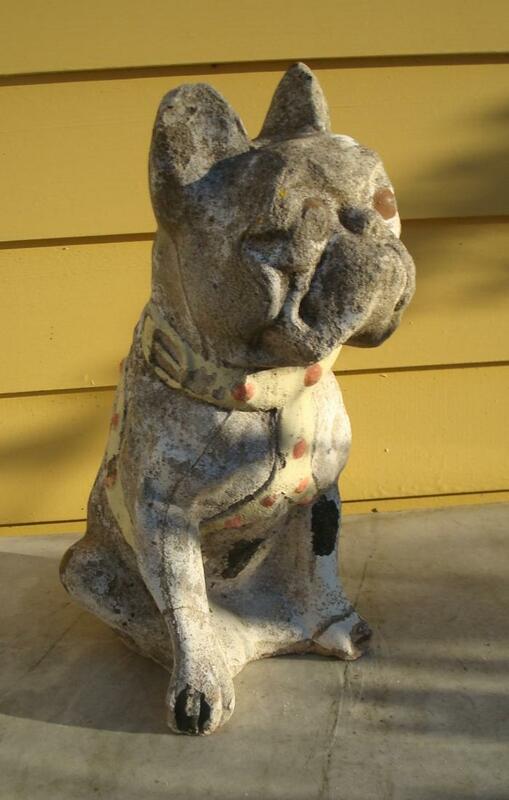 Description: Charming vintage cast stone statue of seated bull dog with old paint decorated harness and collar. Endearing gift for exterior or interior. 13 inches high, 6 inches wide and 7 and 1/2 inches deep. $45. 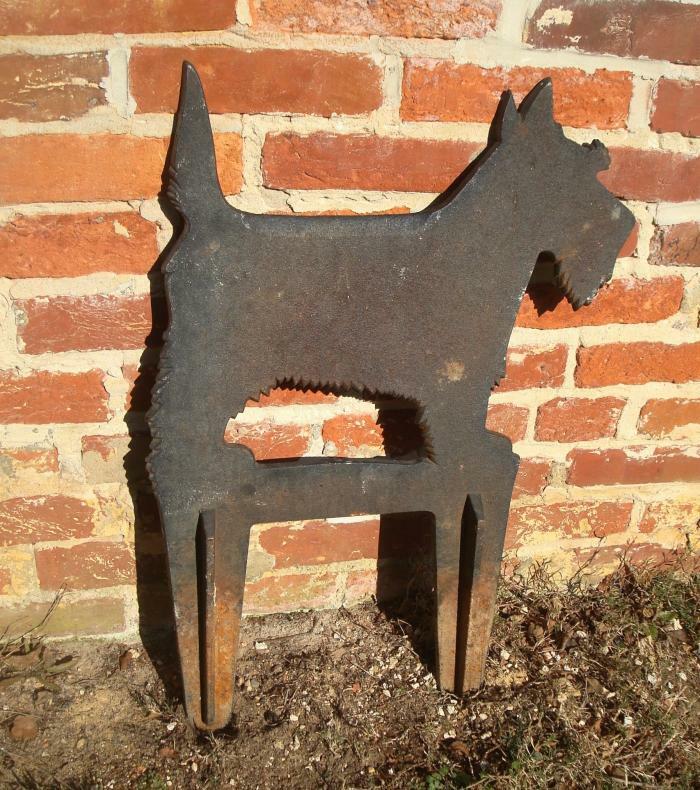 Description: Exceptional heavy iron Terrier Dog form boot scraper. Large size with heavy supports to sink it in the ground near an entrance or doorway. Very early 20th century. 24 inches high, 18 inches wide. $350. 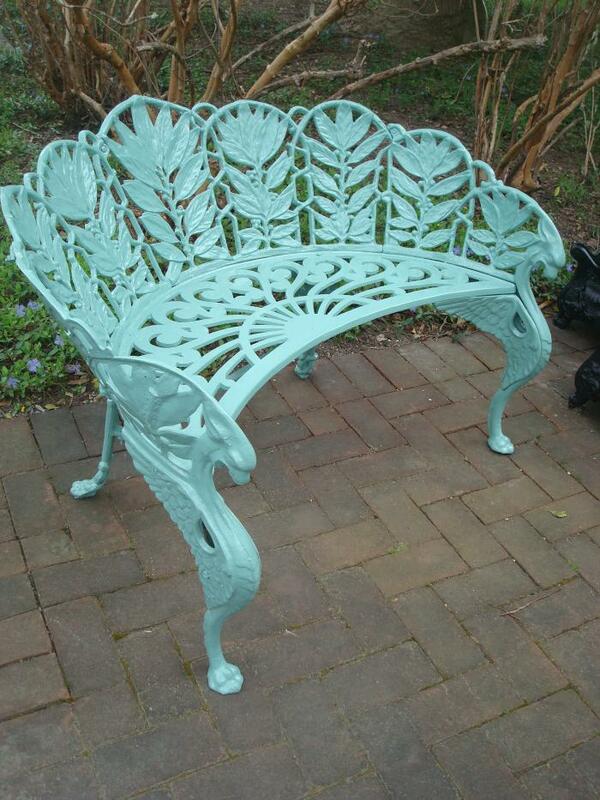 Description: Cast zinc garden bench in beautiful classical design, with curved back with entwined scrolls, palmettes and stylized leafage over a lattice work seat. Professionally cleaned and repainted black. 32 inches high, 49 1/2 inches wide and 22 inches deep.